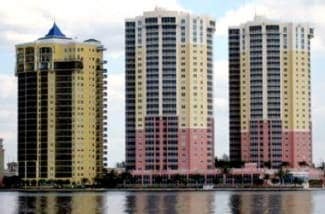 St Tropez and Riviera are twin 27 story luxury high-rise condominiums leading the redevelopment renaissance in downtown Fort Myers River District. They offer residents breathtaking views and sunsets across the Caloosahatchee River. Description of Photo from left to right – Beau Rivage, St. Tropez and Riviera Condominium Towers Riviera is located on First Avenue featuring 300 opulent condominiums with upscale lifestyle amenities to match. St Tropez – It doesn’t get better than this!